Lori-Ann Murphy co-founded Reel Women Fly Fishing Adventures in 1992, the first company to offer "women only" trips all over the world. Since then, Reel Women has grown to include: women and men guided float trips, coed guide schools, basic fly fishing schools, casting clinics, & destination trips for everyone. 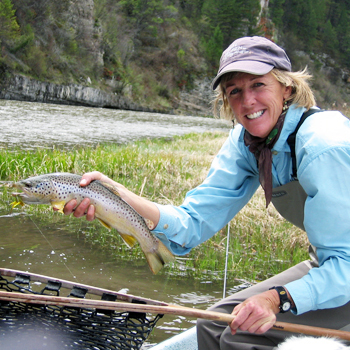 She was the first woman to become an Orvis-endorsed fly fishing guide in 1988, and has served as a consultant to several tackle companies in the fly fishing industry. This show features a panel of three top women fly fishers from Alaska, Idaho and as far down as the Florida Keys. Cecilia 'Pudge' Kleinkauf, Lori-Ann Murphy and Diana Rudolph will be our guests. All three know their fly fishing and know the business of fly fishing—they are all working professionals in the industry. Join us to learn more about fly fishing and how women are raising the bar—Diana won the Hawley Invitational Tarpon Tournament, a male dominated event and she holds two I.G.F.A. fly division records. She is currently on the Pro Staff for Rio Products and ClackaCraft drift boats. Lori-Ann has a distinct love for fly-casting and was honored to win "The Best of the West" ISE Casting Competition in 2003. Her enthusiasm and dedication to our sport is unparalleled and guaranteed to be contagious for everyone around her. Lori-Ann’s home waters are located in Idaho, Montana, and Wyoming near Jackson Hole. In addition, she has a beautiful cottage for rent in Willow Creek, Montana for anyone wanting to spend some time fishing the local rivers! When she is not fishing or guiding on the river, Lori-Ann can be found giving presentations at sport shows and fly fishing clubs around the United States. Lori-Ann has been prominently featured in: The New York Times, CNN's Impact, Outside Magazine, ESPN and Martha Stewart Living. She worked as the fly fishing consultant for Meryl Streep and Kevin Bacon in the movie The River Wild. Martha Stewart asked Lori-Ann to join her in the Wyoming Wilderness for four days of camping and fishing for a featured article in her magazine. She also guided Ethan Hawk on the Madison River for the Oxygen channel’s Free Ride with Greta Gaines show. ESPN’s Cumberland Street covered Reel Women’s Big Horn River 2002 Guide School, and Lori-Ann competed in both the 2001 & 2002 ESPN Great Outdoor Games. However, her greatest accomplishment is working with The Reel Women Guide Team and spending time with people who love to experience nature through fly fishing. For more information on Lori-Ann's trips, school and guide service visit her web site at www.reel-women.com.